The Great Barrier Reef catchments are largely rural and dominated by summer monsoonal rains and occasional cyclones delivering sediments, nutrients and pesticides to the inshore and sometimes offshore portions of the reef in pulsed flows, which can be affected by water reservoirs and dams. Grazing (77 per cent) is the dominant agricultural land use, particularly in the Burdekin and Fitzroy regions. Sugarcane (1.4 per cent) and horticulture crops (0.2 per cent) are more prevalent on the coastal floodplain with high rainfall and irrigation. Grain crops and irrigated cotton are prevalent in the inland areas of the Fitzroy region. Small urban centres are located on the coastal strip. Habitats include wetlands, reef, seagrass and mangroves, and continental and coral islands are present. Reef-based tourism, as well as commercial and recreational fisheries, are an important part of the regional economy. 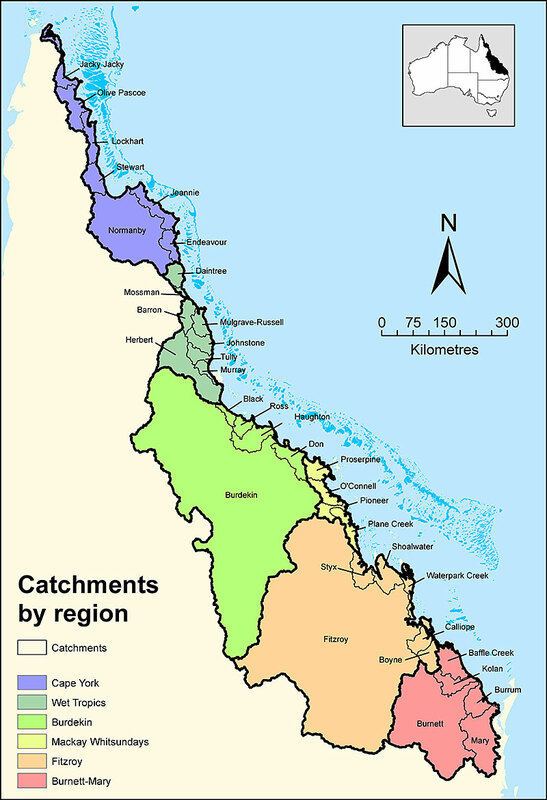 Water quality targets have been set for the catchments that drain to the Great Barrier Reef.